Check out this fantastic green modest prom dress from Twirl Prom! It's very stylish, featuring a square neck and a beaded empire line. 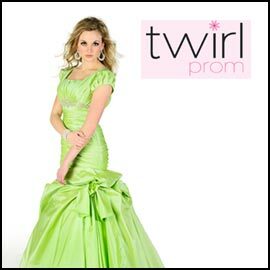 The folks at Twirl Prom call it the "Rose" dress, and the website calls the color "mint," though we think it looks more like lime green. We think it's a stunner, while still being conservative. It appears to be one of the pricier items offered by Twirl, but the online gallery does have some variety, both in terms of dress styles and prices. According to the website, the company designs dresses specifically for women who want to be modest. Give 'em a look!